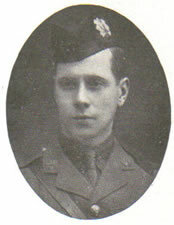 William John Aitchison was born in 1893, and attended George Heriot’s School from 1905 – 1912. He was the second son of Mr and Mrs John Aitchison, 153 Warrender Park Road. He was in the 1st XV and 1st XI. He was a Prefect, and an O.T.C. cadet from 1909 – 1912. On leaving school, he was apprenticed with Messrs. Chiene & Tait, C.A., 3 Albyn Place. In 1913, he was a Private in the 9th Royal Scots (Highlanders). He was then in the 12th Highland Light Infantry as 2nd Lieutenant and served in Loos, France. He is mentioned in dispatches. He was in charge of the Machine Gun Section. He was mortally wounded on 23rd October 1915 and died in the Dressing Station at Vermelles. His name was on the WW1 memorial of North Merchiston Church.